Safety - Netook Construction Ltd.Netook Construction Ltd.
Netook Construction Ltd. is committed to maintaining a safe working environment. To this end, Netook Construction has implemented safety and training programs that are designed to improve performance and continue to raise awareness of the importance of safety in operations.Netook Construction currently holds a “Certificate of Recognition” (COR), and has held one since 1999. Netook Construction has also been recognized as a “Work Safe Alberta” Best Safety Performer for the years 2003 through 2009. The health and safety of each employee of Netook Construction is of great importance.Netook Construction has implemented a safety program with a target of zero accidents and incidents. The result of this program is evident through Netook Construction’s safe work track record and the numerous safety awards that have been earned over the years.Netook Construction recognizes that the responsibilities for safety are shared. As such, Netook Construction accepts responsibility for leadership and implementation of the safety program, as well as the continual improvement of the program to ensure that the proper safeguards and motivation for a safe work environment are continued. 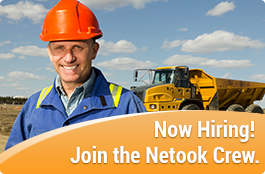 Netook Construction follows the Petroleum Industry Guiding Principles for Worker Safety. Netook Construction has also received the Alberta Best Safety Performer certificate from the Alberta Occupational Health and Safety Council. This was in recognition of exceptional performance in workplace health and safety.